Don't know what might look best in your yard? Let our professional landscape design team help! Mansfield Landscaping has one of the largest selections of flowers, plants and shrubs in Central Florida, all to make your home look even more beautiful. Accentuate a beautiful pool, or provide a welcoming entrance to your home for your guests and yourself. It’s never pleasant for employees or customers to pull into a parking lot of a building surrounded only by pavement or barren and rugged appearing landscape. Successful companies understand that it’s not only important to have an aesthetically pleasing interior work environment, but also an inviting and beautiful exterior that encourages employees to look forward to coming to work, in turn boosting productivity and pride in the image of their workplace. There are several simple landscaping solutions that are not only economical but serve dual purposes of providing shade, wind protection and reduced cooling costs in warmer months. 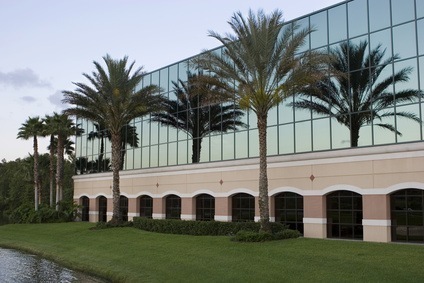 • Without going overboard, use landscaping to focus on the facade of the building - provide both employees and clients with a stunning and sophisticated welcome entrance. A few overgrown, lush green filler plants provide a nice simple guide to the front door. • Add a pop of color to complement the facade of the building. The professionals at Mansfield Landscaping can provide you with advice on the perfect flowers that are colorful, affordable and long lasting. • Incorporate inviting benches around the grounds of the company to encourage employees and clients to enjoy the fresh air. Colorful plants placed near the benches add a zen quality - promoting relaxation and returning to work with a clear and refreshed mind. • Remember to save room for growing and maturing trees and plants. Mansfield Landscaping's professional landscapers know how to precisely space out larger shrubs and trees after providing you with a finished layout before beginning your landscaping project. • It’s always a good idea to include local species of trees and plants and to consider including an irrigation system that channels water from rain to areas that need it the most. Mansfield Landscaping, Central Florida's Premier Commercial Landscaper, is here to answer all of your landscape design questions and to collaborate with you to come up with the perfect plan for your commercial landscaping. Contact us today for more information.